Check out these amazing zinc facts, uses and properties. Zinc is corrosion resistent, recyclable and very important for the human body. Learn more about these facts and others by enjoying our interesting facts about zinc. Zinc is a chemical element with the symbol Zn and atomic number 30. Another name for zinc, in non-scientific terms, is "spelter". 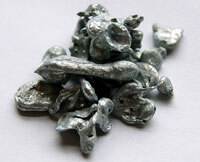 Pure zinc is a shiny bluish-white colored metal, while commercial grades of the metal usually have a dull finish to it. Zinc is the 24th most abundant element in the Earth's crust. The melting point of zinc is 787.1 °F (419.5 °C) and the boiling point is 1,664.6 °F (907 °C). Brass is a zinc and copper alloy that has been used by humans since ancient times. Zinc metal however, was first produced on mass in 12th century India. While Europe did not know about zinc metal until the end of the 16th century. An important quality of zinc is its ability to resist corrosion and therefore protect other metals. Half of all zinc produced today is used to galvanize steel to prevent against corrosion. It is used to protect buildings, cars, nails, wire, pipes and more. Zinc compounds such as zinc oxide are found in many common commercial products, including batteries, paint, plastics, rubber products, pharmaceuticals, floor coverings, inks, cosmetics, soap, and textiles. Zinc is also a natural insect repellent and sun screen, helping to protect our skin. Zinc is an essential nutritional mineral for humans and animals alike. After iron, it is the second most common trace metal found naturally in our bodies. Zinc helps our immune system fight off invading bacteria and viruses while our cells require zinc to help build DNA. Our bodies need zinc to grow and develop properly making it very important for children and during pregnancy. Foods that are a great source of zinc include lean red meats like beef, lamb and liver and seafood such as oysters and lobster. Whole grains, seeds, beans, nuts, and almonds are all good sources if grown in zinc rich soil. Zinc carbonates were identified in the oldest known pills which were believed to be used for sore eyes, found aboard a Roman ship that wrecked in 140 BC. Zinc deficiency is associated with many diseases and is believed to affect around 2 billion people in the developing world. Even though zinc is an essential requirement for good health, excess zinc can be harmful, suppressing copper and iron absorption. The U.S penny coin is made of 97.5% zinc and there have been cases of zinc toxicity after humans and dogs ingested the coins. In 2010, China produced nearly a third of the global zinc output. Other notable zinc mining countries include Australia and Peru. After iron, aluminium, and copper, zinc is the fourth most common metal we use today. Around 70% of the world's zinc comes from mining, the remaining 30% comes from recycling the metal because zinc is 100% recyclable.